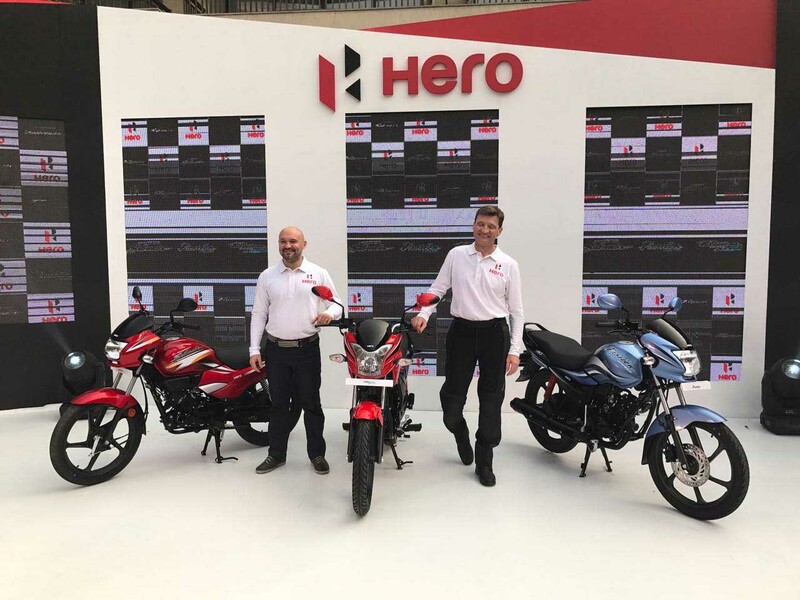 NewDelhi : In keeping with its aggressive product strategy, Hero MotoCorp Ltd. (HMCL), the world’s largest two-wheeler manufacturer, today unveiled three new motorcycles – the 125cc Super Splendor, the 110cc Passion PRO and the 110cc Passion XPRO. Close on the heels of a record-breaking festive season, the Company is aiming to further augment its dominant market leadership through the launch of these new youthful, powerful, stylish, and efficient range of motorcycles. There will be a phase-wise launch of the three motorcycles in the market, starting January 2018. Hero MotoCorp is already the dominant leader in the 100-125cc segments with its popular brands – Splendor, Passion, HF Deluxe, Glamour, and Super Splendor. Designed for today’s smart generation, the performance-oriented and boldly styled new 110cc Passion PRO is loaded with an array of convenience, safety and utility features, which integrate seamlessly to offer improved handling and a hassle-free riding experience. The modern appeal of the bike and best-in-class performance promises to offer an enhanced experience to the customers. The new Passion PRO draws its unmatched performance from a BS-IV compliant 110cc TOD (Torque on Demand) engine, producing a maximum power output of 7.0 (9.4) kW (PS) @ 7500 rpm and maximum torque of 9.0 Nm @ 5500 rpm. The fuel efficient and cleaner engine offers more usable power. The new sharper Passion XPRO offers the right mix of style, technology and bestin-class performance. Targeted at the youth, the motorcycle comes packed with a host of modern and stylish features, including the new sharper Fuel Tank with Flush fuel lid, dynamic shrouds, sporty real cowl, duel-tone mirrors, LED Tail Lamp and Digital-Analog meter with digital Fuel Gauge. All Time Headlamp On (AHO) offers superior visibility and safety. The new motorcycle comes with a BS-IV compliant 110cc (Torque on Demand) engine, producing a maximum power output of 7.0 (9.4) kW (PS) @ 7500 rpm and maximum torque of 9.0 Nm @ 5500 rpm. Targeted at young professionals, the new Super Splendor ticks all the right boxes with its best-in-class performance and stability. This is in addition to the trust, reliability and fuel efficiency that are distinct to the Splendor brand. The powerful commuter comes with a new Air-Cooled, 4-stroke single Cylinder OHC 125cc TOD (Torque-on-Demand) engine that also features the highly efficient and proven Hero i3S technology. The engine produces a maximum power output of 8.4 (11.4) kW (PS) @ 7500 rpm and maximum torque of 11 Nm @6000 rpm. The motorcycle offers 27% more power and 6% more torque than its previous generation. The bike reaches a maximum speed of 94 km/h.